Judah is growing up so fast! - Eye (as he points to your eyeball and tries to put his finger in the socket!) Aunt Melissa taught him that! He attempted the word "Claire" the other day but it was mostly spit bubbles and slapping my belly where Claire is. It was pretty funny, nonetheless! Today is Valentine's Day and he got a rose at church which he ate. His poop, however, did not smell like the rose. I felt a bit ripped off! Here are some pictures of his first birthday party. It was big fun! Lots of friends came and we had a blast. Here is his baseball cake that mommy made all by herself!! 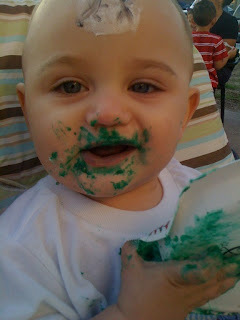 Here is Judah devouring the cake! A Smooth Guy Is Turning ONE!! I cannot believe Judah will be one year old on Tuesday!! His first birthday party is tomorrow. Before I know it he will be 16 ready to drive... Lord help me! This year has been filled with so many happy times for us. I am so overwhelmed by God's love when I look at my son. I can't fathom how anyone could love somebody more than I love Judah and yet I know that God loves me a million times more. In the words of the midget white guy from the Princess Bride... "Inconceivable!" I am more in love with my Savior today because of my son. So... thank you Judah for coming into my life and flooding me with so many thoughts and feelings I never knew I could have. You are the best gift I've ever known and you are so loved by Daddy and me. Here is his invitation to the big celebration if you want to come! !